In my grandparents’ day, working families had a real shot at owning a home, giving their kids an education, retiring with a pension, and seeing the next generation live even better than they did. But over the past half century, changes to our tax and benefit laws have funneled all the economic gains into the hands of a very few, who need it the least. Meanwhile, real wages for working and middle class families have stagnated. Now millions face the stress and insecurity of juggling part-time jobs and gig work with no benefits, always just one unpaid bill away from disaster. The American economy needs to work for everyone, especially those who face barriers to employment. Everybody deserves at least a fair shake — a useful education, a living wage, a healthy environment, decent housing they can afford, and healthcare worthy of the world’s largest national economy. I don’t believe this is too much to ask. In fact, many other nations have figured out how to manage these issues better than we do, so it’s high time we start innovating. The right to health care is the right to life. Every year, people without access to doctors and treatment, right here in Georgia, are dying prematurely or from entirely preventable causes, and that includes children. It’s a public shame for our state, and it doesn’t have to continue. As the father of two children and the husband of an ER nurse, I am committed to increasing access to healthcare in our state, not continuing to restrict it. Georgia has the fourth highest uninsured rate in the country, with well over a million people lacking health insurance. The primary reason is Georgia’s failure to close the Medicaid insurance gap. 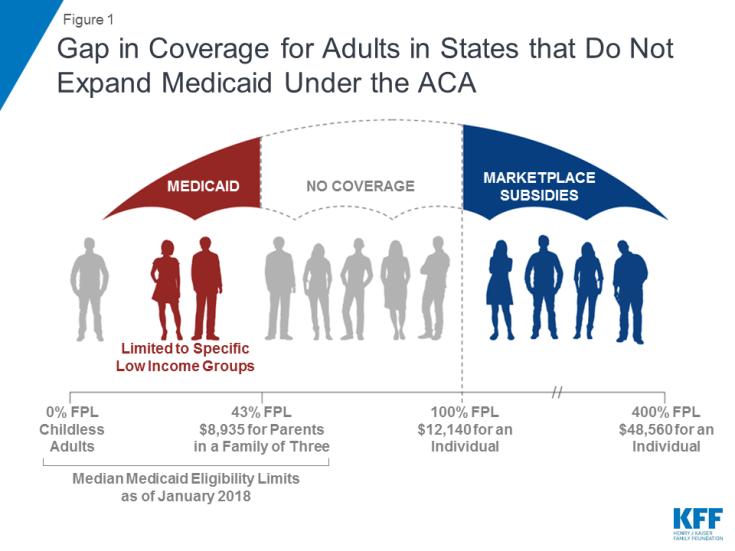 This gap was created when the courts allowed states to opt out of receiving a slice of Medicaid funds included in the Affordable Care Act — leaving folks who earn “too much for Medicaid, but not enough for subsidies” stranded without the security and protection of health insurance. All the states that opted in to the new Medicaid in January of 2019 are still with it, and 9 more states have opted in since. The uninsured rates in opt-out states like Georgia lag farther behind every year. It’s past time for Georgia to end “pay-in/opt-out” and close the insurance gap like Utah, Idaho, Michigan, Virginia, Pennsylvania, Maine, and other states have decided to do. Every year, hospitals and trauma centers are shut down in Georgia because the insurance gap means they don’t get paid, even if families go bankrupt from medical bills! So more folks die trying to make it to the next nearest hospital. And now that hospital isn’t getting paid to see all the new uninsured patients who have to be taken there, putting it in danger of closing as well. We have to fix this problem now! Not only will hundreds of thousands of Georgians gain access to quality healthcare, but modest estimates indicate that closing the Medicaid gap will result in more than $65 billion in economic activity and more than 56,000 jobs throughout the state in just ten years. Because the new Medicaid covers costs which states are currently paying elsewhere, states from New Mexico to Louisiana to Ohio to West Virginia and others have actually saved money by opting in. Medicaid can also help us lower the death rate for women giving birth in Georgia, which is the second highest in the US. We must institute a care coordination program within Medicaid aimed at lowering the maternal mortality rate overall and especially for women of color, who die in labor at more than twice the rate of other women. It simply costs more to provide treatment to people who aren’t insured, who aren’t getting preventive care, who are distant from treatment centers, and who don’t have access to technology such as remote conferencing with specialists. So let’s do what makes sense and invest in our healthcare system like we invest in our highways and power plants — the return on that investment will be tremendous. Democracy and the market economy can only function when everyone gets a fair shake. And right now in Georgia, that’s not happening. While Georgia may be a good place to own a business, it’s not a great place to work. Our unemployment rate is 50% higher than the best states, we have the seventh highest rate of income inequality, and our quality of life is worse than 70% of all other US states. That’s not success in my book. It’s no coincidence that Georgia is also tied for the lowest minimum wage in the nation. One in every 25 workers in Georgia earns at or below federal minimum wage. And those low pay rates serve as a “benchmark” keeping other wages down as well. This keeps unemployment high because when employees earn less, they spend less, so businesses sell less, meaning they don’t need as many employees. The fact is, we can’t have millions of adults making poverty wages, and make cuts to public assistance, and have a strong economy with low crime at the same time. The solution is to pay workers a living wage. This will not only improve the lives of hard-working Georgians, but it will also stimulate our state’s economy and create jobs. By making Georgia a better place to work, we will improve our quality of life, grow our economy, reduce the need for tax-supported assistance, and reduce crime. As a businessman, I understand that solid companies locate and grow where policies favor an even playing field, a pleasant life, public safety, and skilled workers. That’s why I support improving education, providing support for training, and raising the minimum wage. Right now, our tax code is tilted to benefit the wealthy, leaving working families to shoulder more of the burden, and that’s just not fair. There are six things we can do right now to start giving a fair shake to low-income and middle class taxpayers. This may be the single easiest step we can take to reduce wealth inequality. It’s a simple formula — the wider the gap gets between the super wealthy and everyone else, the higher the tax rates are on very large incomes. This puts a safety valve on efforts to game the system and stops our effective tax rates from going “upside-down”. Lately it seems that every big corporation is asking to be let off the tax hook. But some of those large companies are costing the state millions of dollars in public assistance by refusing to pay a living wage to their employees. We need to change that. Those enterprises paying a living wage should be considered for tax breaks if they’re going above and beyond to benefit our economy. But those paying poverty-level wages are passing off their payroll cost to the taxpayer, and should therefore be paying a significant share of those taxes themselves. There should be no tax reductions for businesses that cost the state significant money in public benefits for their workforce. Georgia’s corporate income tax is currently capped at 6%, which ties the legislature’s hands when it comes to economic emergencies or funding badly needed public projects. Let’s let the General Assembly do its job and set corporate rates where they need to be in any given year. Georgia is not one of the 30 states that currently offer a state-level Earned Income Tax Credit expansion. Earned Income Tax Credits are state-level tax credits offered to help working, low-income families meet basic needs. States which have expanded the program report negligible administrative costs, while the Center for Budget and Policy Priorities determined that the 1990’s Federal Earned Income Tax Credit expansion led to better health outcomes, education, and future earnings for working families. Popular expansions to the program include adding a self-employment credit and raising the income ceiling to receive credits. Municipal tax-base sharing is a policy that promotes regional prosperity and keeps local economies stable by putting a brake on those that “heat up” too quickly, making housing unaffordable for everybody, and those that “cool off” too fast, sending the town into a negative spiral. Tax-base sharing means each municipality doesn’t have to overbuild high-end housing in an effort to compete for that slice of the area property tax total, and both low-density rural spaces and high-density urban spaces can plan their futures together across technical boundary lines. Without a tax-base sharing pool, local residents can lose control of the housing market in an otherwise good economy if speculation takes hold, pricing families out of their own neighborhoods. And in areas where populations are becoming less dense, a decrease in available tax dollars can mean the town has to resort to increasing traffic fines and all sorts of fees, which of course end up being most expensive for those with the least income. Tax-base sharing keeps municipal budgets more stable, and improves civic planning which means better quality of life for everyone. I have two young kids, and like every parent I want the best for them. And not just the best job opportunities and best education — I also want them to come home every day happy and safe and proud of what they’ve learned. And as a recent back-to-college graduate myself, I understand the obstacles standing in the way of working people who want to continue their education, many times in order to stay employed or advance their careers. Public education is a right guaranteed to all of Georgia’s children by our state constitution. And our state’s future depends on reform from pre-K all the way through university. According to the latest National Assessment of Educational Progress (NAEP), Georgia’s students perform below the national average in reading and science, and significantly below average in writing and math. Our graduation rates also lag behind the US average. These statistics are discouraging, but aren’t really surprising, given that we only fully funded our public schools in 2018 for the first time in 16 years. To secure a prosperous future for our kids, and a competitive economy in our state, we need more qualified, better-paid teachers and improved resources, because under-resourcing our public schools will inevitably cost us substantially more than properly funding them. But a good education is about much more than just funding levels. For too long now, we have relied on standardized testing as the sole measure of student achievement. As a result, subjects such as art, music, and even civics have been left behind. Did you know, only one in four Americans today can name the 3 branches of government. And a recent NAEP study found that 77% of eighth graders are below proficiency in civics. But without a knowledge of civics, students graduate without knowing how their government works, what the courts do, who their state and local officials are, how to start a business, or even why their vote matters. Is it any wonder that voter participation and trust in government are at their lowest levels in decades? Our education system shouldn’t be just about training kids for jobs – we should be training our children to be good citizens and thoughtful, resilient adults. Wrap-around services are another victim of our cost-cutting and standardized-testing mentality. On-site school nurses, mental health resources, physical education, nutritional instruction, and college and career counseling have all fallen under the ax. Yet countless studies prove that children cannot effectively learn, are much more likely to act out or skip school, and are less successful in later life if they go to school hungry, if they are confined all day without a break, if they receive no guidance when transitioning from high school to work or college, if they receive no counseling when facing emotional or mental health issues, and if they receive no opportunities for creative outlets. It’s simply not true that struggling unnecessarily as children will make students more successful as adults. Those few who overcome childhood deprivation do so against the odds. Just as a tree denied sunlight and nourishment will never grow as tall or strong as one properly tended to, a child whose physical, intellectual, emotional, and creative development is stunted by lack of resources will not be as successful as a child who is well fed, valued, and given the opportunity to exercise their mind and body and creativity every day. Yes, we should challenge our students — but those challenges should be meaningful and productive, with competent and caring adults there to ensure our kids have the resources at hand to meet them. It is a cliche that the children are our future. It is also an undeniable truth. Their education and wellbeing is the most precious and important investment we can make. Employers in Georgia are struggling with shortages of skilled workers. The lack of a living wage in Georgia is a large part of the problem, but access to training and education for Georgians is another part. Providing Georgians with the opportunity to get a tuition-free education at a technical school will end up solving many employers’ problems finding skilled workers, which will lower our unemployment rate, which means more economic activity to keep business healthy. There are young people in Georgia right now who could help make our state more successful, but will never get the chance because they can’t afford to stay in school after high school. There are parents of talented kids who are working unpaid overtime week after week and still have no way of paying tuition. And there are people working all over the state who could move up and do more if they could get into a class or a lab. Publicly funding our technical schools is an investment in our own prosperity. No Georgian should ever have their right to vote violated by administrative barriers, vote suppression, or gerrymandering. It’s time to establish the Georgia Voting Rights Commission to reinstate oversight allowable under Section V of the Voting Rights Act. The commission should ensure that all aspects of voting, including precinct office locations and operating hours, early voting schedules, registration procedures, district boundaries, and election security enable every eligible voter to cast a ballot. Every Georgian should have the right to clean, safe air and water. Unfortunately, some businesses are starting to infringe on these rights through chemical dumping into our rivers and water supply, with a complete disregard for the environment that we live in. We must put our environment first, because none of us can have a high quality of life without safe water, clean air, and land that’s left wild as I believe God intended. Further, we must immediately start working to reduce greenhouse gases by moving to new technologies that will also create jobs in our state, such as solar and wind development, and methods of capturing carbon in the earth to improve our topsoil while lowering atmospheric CO2. Georgia needs to commit to reaching 100% renewable energy statewide to grow new industries, reduce energy costs, and work toward sustainability. Transportation is a necessity of modern life, and we must work toward making it accessible to everyone. Municipal transit systems, such as Athens Transit, must be expanded to reach more people in our community and reduce traffic loads, air pollution, and wear and tear on our infrastructure. Further, we must work to create “complete streets” — roads that are as friendly to bikes and pedestrians as they are to motor vehicles. It is critical that we make alternatives to the expense of owning a car available to as many residents as possible. With an increasing gap between income and housing costs, hard working Georgians are left in the lurch. In Athens-Clarke County, where I live, only 59% of people working in the county actually live there. Families unable to find housing at an affordable cost are forced to live further distances from their workplace, which increases traffic and pollution and reduces the time parents can spend with their kids. This problem is faced by too many Georgians today, and we must work to change it by increasing access to decent, affordable workforce housing. There’s a lot of work that needs to be done to make our criminal justice system more fair. But there are two steps we can take now that will dramatically improve the equal application of justice in our state. We must put an end to the use of money as a form of pre-trial bond for any person accused of any crime and abolish mandatory minimum sentencing. Judges should be free to set the penalties they see fit, case by case, without arbitrary minimums being set by legislatures who have never even heard the case. And we should determine who is released before trial according to their level (or lack) of threat to the community, not according to who can and can’t afford to pay to get out. According to the ACLU, marijuana arrests cost Georgians over $300,000,000 in taxes every year. This hefty price tag comes with an even larger problem attached — the social ills of criminalizing marijuana are greater than the social ills of marijuana use itself. An arrest for simple possession can lead to a person being fired from their job, spending time in jail, racking up debt from court costs, and being unable to make a living wage for the rest of their lives. All for possession of a substance that’s no more dangerous than alcohol and tobacco. Plus, multiple studies reveal that people of color are searched and arrested for drug offenses much more often than whites, even though they are less likely to be carrying drugs to begin with. Jailing a person for simple possession puts them into the “prison pipeline” that wreaks havoc upon entire generations of families. Georgia ranks sixth in the country for number of people arrested for marijuana, and is one of the top states for probation, with approximately $34 million in supervision fees. These enormous taxpayer costs can be greatly reduced by allowing marijuana for medical usage. Last year, Georgia made great progress when it comes to the expansion of medical marijuana in the state. Although Georgia is moving in the right direction, many who suffer from conditions other than epilepsy need cannabis products that contain higher levels of THC than the law currently allows for. It is common sense for Georgia to expand medical marijuana legislation in Georgia, in the goal of easing the suffering of our fellow citizens. Too many lives are being lost to gun violence every day, and common sense gun laws could bring an end to this chronic injustice. I am a gun owner. But just as I accept that I must register my vehicle and obtain a license to drive it before taking a car out on the road, I also accept that owning and operating a firearm should come with personal responsibility, including a minimum of training and safety instruction. It is our social responsibility to require safe storage of guns, expand our background check system, raise the minimum age to purchase a gun to 21, and require owner training to obtain a carry license. Furthermore, we must work toward repealing campus carry, outlawing bump stocks and high-capacity magazines, banning long guns at rallies, and requiring owners of firearms to purchase liability insurance on their weapons. Lastly, we must pass a bill allowing for a new type of restraining order that would require an individual who has a history of unpredictable or aggressive behavior to forfeit their weapons for a length of time as to ensure their own safety and the safety of everyone around them.